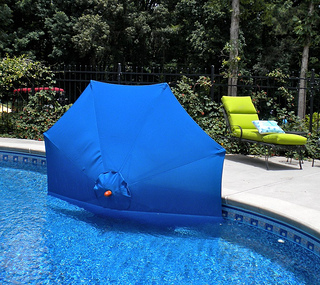 I wish I could tell you that this was the one and only time our pool umbrella has been "rearranged" by the wind. Unfortunately we have experienced umbrellas in the pool and in the yard - sometimes still intact and other times, with broken ribs. We have done just about everything possible to allow our umbrellas to take flight. Such as putting one umbrella in a patio table without a base, using the wrong weight for the stand, and leaving them open when we knew a storm was coming. Get my four top tips for protecting your investment so that you can enjoy your patio umbrellas for years to come.